Papers: ca. 1922-1980, 110 cubic feet. 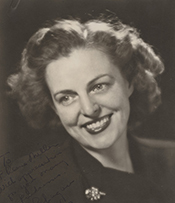 The papers of Helen Gahagan Douglas contain the following series: Theatrical Materials, Legislative, General, Legislative Reference, General Reference, Political Papers, and Subject and Personality Files. The papers also include drafts and galleys of her memoir entitled A Full Life. An inventory for the papers is available in the repository and online: http://www.ou.edu/special/albertctr/archives/douglas.htm. Oral History: 1973-1978, 1,371 pages, including index. This oral history transcript of an interview with Helen Gahagan Douglas is a copy of an interview conducted by The Bancroft Library, University of California, Berkeley. Oral History: 1973-1976, 345 pages. The interview consists of the reminiscences of Helen Gahagan Douglas. Oral History: 1973-1978, 1,293 leaves. Center for the Study of History and Memory. Transcripts and Sound Tape Reels. 1973-1983, 7 volumes. The project consists of interviews with Helen Gahagan Douglas and her friends and acquaintances. Highlights include Douglass theatrical and political career, her marriage to actor Melvyn Douglas, and interest in liberal causes. Oral History: November 10, 1969, 52 pages. An oral history interview with Helen Gahagan Douglas. Oral History: November 1972, 13 pages. Oral History: 1979, 26 pages. An oral history interview with Helen Gahagan Douglas. In the interview, she discusses the Roosevelts in the White House. Oral History: 1973-1976 and 1982, 352 pages and related material. The Helen Gahagan Douglas project consists of four volumes and related material. The interview was conducted by Amelia Fry for the Regional Oral History Office for The Bancroft Library, University of California, Berkeley, California from 1973-1976 and 1982. Photographs: ca. 1930-1975, approximately 25 photographic prints and 45 negatives. Portraits and snapshots from various periods in Helen Gahagan Douglass life, and a series of portrait negatives taken during an oral history interview. Some portraits are with composer Joseph Marx during a European opera tour of 1937. Other images are from her career in politics. Correspondents include Helen Gahagan Douglas. Photographs: In the Johan Hagemeyer photograph collection, ca. 1908-1955, amount unknown. Persons represented include Helen Gahagan Douglas. Papers: In the Florence McChesney Clifton collection on California Democratic Party, 1938-1966, 1.2 linear feet. Papers: In the Julia Gorman Porter papers, ca. 1906-1987, 0.8 linear foot. Other authors include Helen Gahagan Douglas. Oral History: In Earl Warren: Politics in his era in California. Catalog and card index in university Regional Oral History Office. Papers: In the Ruth Lybeck papers, 1944-1950, 2 linear feet. The collection consists of material related to the political campaigns of California congresswoman Helen Gahagan Douglas.